"Hi there, ladies and gents! I'm Biff, your trusty ARMS commentator!" 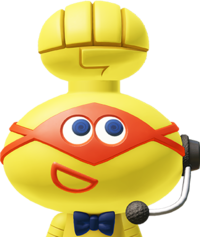 Biff is a commentator for ARMS League matches. He appears in announcement videos as a host and in-game in Grand Prix to provide fighter introductions and tips to the player. Biff is a roughly humanoid, yellow being of unknown species with a large, oblong head that has a hand protruding from the top of it, usually clenched in a fist but opening when he is surprised. Like most of the fighters in ARMS, he has spiraled irises. Similarly, he also appears to have extendable ARMS. The only clothes he wears are a scarlet, diamond-shaped mask and a navy blue bow tie. Art from the official ARMS Twitter, showing Biff's extendable arms. Biff receiving Ribbon Girl's autograph. The Tri-Shot Biffler ARM is named after Biff. Biff's name is similar to an onomatopoeia in comics used when a character punches. There is an implied rivalry between Biff and Lola Pop, as they each have bakeries right next to each other, and one of her promotional art photos shows Biff glaring at her while she performs in front of her bakery. ↑ Nintendo of America. "ARMS – Nintendo Direct 4.12.2017", retrieved 2017-05-14. ↑ Yū Kobayashi. "Official Account Tweet". This page was last edited on 26 February 2019, at 16:48.